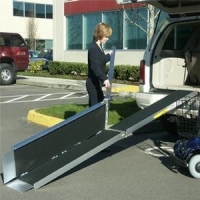 EZ Access Trifold Advantage Series 5'-10' this ramp is perfect for a vehicle. It also is great for taking it on the go to a friends or families house where it is not as accessible for a scooter or wheelchair. It is great for traveling and also works on a 2-3 step entry way. This ramp folds up and also splits apart in two for a light weight carrying option. This ramp is available from 5'-10'.